If you're after a well-specified macro lens with a longer than average focal length for shooting easily-spooked subjects like insects, the 150mm Dragonfly is a great choice, providing you can do without autofocus. Irix burst onto the lens market recently with 11mm and 15mm ultra-wide full-frame lenses, and both handled and performed very well in our testing. Having succeeded in the wide-angle sector, Irix is now closing in on the macro market, and its first attempt here is the 150mm f/2.8 Dragonfly. As macro lenses go, 150mm is a relatively long focal length, but it's ideal if you want to shoot live subjects like bugs, or indeed, dragonflies. The lens's 1:1 magnification ratio means your subject is reproduced at the same size on the image sensor as it is in reality, meaning you can get a large, detailed image of a small insect yet be positioned well back from it, reducing the chances of you being rumbled, or simply casting an unwanted shadow with your camera. With Canon and Nikon full-frame DSLR macro lenses generally topping out at 105mm (Nikon's ancient AF Micro-Nikkor 200mm f/4D being the exception), the Dragonfly's main competition is from Sigma's APO MACRO 150mm F2.8 EX DG OS HSM. Though with an RRP of €595, the Dragonfly is significantly cheaper. The Dragonfly follows a similar design ethos to Irix's past lenses like the 15mm f/2.4 Blackstone. The body is magnesium alloy, with distinctive white printed lettering marking magnification factor, as well as focus distance in feet and metres. The grippy, rubberised focus ring has a long 270-degrees of travel, which should theoretically make it easier to apply small focus tweaks, however we found it to be fairly twitchy when you need to make precise focus tweaks. Ahead of the focus ring is a focus locking ring which will locks the focus ring to stop it being accidentally nudged. Unusually for a macro lens, the Dragonfly is fully weather sealed with 5 gaskets protecting ingress points along the lens barrel. It helps make the Dragonfly even more adept at outdoor insect photography. Irix has gone all-out on optical quality, as the Dragonfly's optical path contains 12 elements arranged in 9 groups. Within these are 3 super-low dispersion ED glass elements and a further four higher refractive index (HR) elements. A rounded 11-blade aperture diaphragm promises smooth bokeh. Despite the Dragonfly's fairly compact 87 x 135 mm dimensions and reasonable 840g weight, Irix also includes a tripod mounting collar. It's a useful addition as a well-balanced camera is crucial in achieving the best possible image sharpness. It also makes it very easy to switch between portrait and landscape orientation. Though manual focus only, the Dragonfly still has all the necessary electrical contacts to communicate exposure, aperture and EXIF data with your camera. Being a manual focus lens, it takes a keen eye and very steady hand to set the focus ring to the exact optimum focus point. But get it right and the Dragonfly produces good centre-frame sharpness, from wide open through to f/8. Even so, for a quality prime lens, we would usually expected peak sharpness to top 2000 line widths/picture height. Edge sharpness is a little less noteworthy, but it's still fairly respectable across the entire aperture range. Chromatic aberrations are present at all aperture settings, but are minor enough not to be easily visible in real-world images. These figures are taken from the corners of frame where fringing is at its worst, yet the Dragonfly still performs well in this test. The Dragonfly produces ever so slight pincushion distortion, but it's low enough not to be visible in everyday shooting. 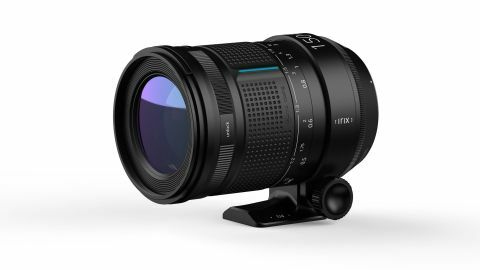 We're fans of Irix's wide-angle lens offerings, and it's good to see Irix's distinctive styling and quality build carried over to the 150mm Dragonfly. Going without autofocus can seem daunting, but the careful, slow-paced world of macro photography really lends itself to manual focusing. If the Dragonfly's focus ring had slightly more rotational travel for easier focus tweaking, it'd be even more enjoyable to shoot with. As with any manual focus lens, peak optical performance is very much user-dependent, but in the right hands the Dragonfly is capable of delivering superb image quality. Image sharpness is high, while fringing and distortion are in real terms almost non issues. Factor the Dragonfly's significantly lower price, lower weight, and weather sealing compared to Sigma's rival 150mm APO Macro lens, and it's clear Irix has another winner here, providing you're good to go manual.